The Shadows occupy a unique niche in British pop as by far the most successful and long-lasting guitar instrumental band, rivalling US counterparts The Ventures in global popularity. 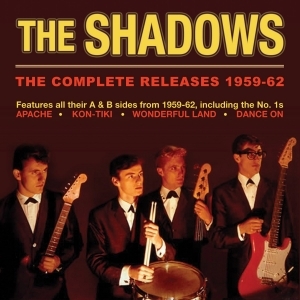 The Shadows initially came to prominence as the backing band for British rock ’n’ roll star Cliff Richard, initially known as The Drifters, but changing their name to The Shadows to avoid confusion with the American R&B vocal group. They had made their first records in their own right as The Drifters, but their breakthrough came as The Shadows with their landmark debut hit “Apache” in 1960. Duane Eddy had provided a bridgehead in the sub-genre of guitar instrumental hits, and The Shadows rapidly developed their own highly distinctive sound and style in this market, their UK profile enabling them to eclipse the primary US competitors in the guitar instrumental arena, The Ventures. They racked up a string of over 30 hits during the next two decades, including five UK No. 1s, and compilation albums of their hits have sold millions of copies around the world. This great-value 61-track 2-CD set comprises just about every record they released in the UK as The Drifters or The Shadows during the first five years of their recording career from their debut in 1958 through to the end of 1962, including the A & B sides of their singles during that era, plus all the tracks from EPs and the tracks from their first two LPs “The Shadows” and “Out Of The Shadows”. It features their nine Top 10 hits from these years, including the No. 1s “Apache”, “Kon-Tiki”, “Wonderful Land” and “Dance On”. It’s a great showcase their talent and versatility, with their album tracks exploring a range of musical styles, and an evocative memento of a highly individual and memorable strand of British pop, which inspired thousands of youngsters to start playing guitar themselves.